I have drawn a map of where everything goes and taken a picture on my phone so it will make it easier to remember where everything is and how to repack it once unloaded. Cooker - Primus lite, Pans and utensils, Thermal liner, Fire stick, multitool, pump (for getting fuel out of tank and in to cooker), water filter. Gear, brake and clutch levers, front and back break pads, heavy duty inner tube, air and oil filters, air canisters for puncture repair, small pump, headlight bulb. Tools include - spanners, screwdrivers, tyre levers, cable ties, tape, alan keys, chemical metal and temp tyre repair canister. I will have my tent, sleeping bag and tripod tied to the bike and my rucksack will hold my camera, paperwork, first aid kit, head torch, compass, map and penknife. Please let me know your thoughts. Particularly if you have been here and done this. We all have our own ways but it's good to share experiences. It could save me a lot of learning time!! So that's it. I am now working on my Visa's and this is proving a little less complicated that I originally thought so don't let the paperwork scare you if you are considering something like this yourself. These things can take time to plan but all it takes is a little self motivation and a desire to get out on the road. As time ticks away nearer to my leaving day I grow more and more excited and never in doubt! I am no expert but please feel free to ask any questions you like if you are considering something similar. I don' t see see a pistol on your list. Don't leave home without out it. Can't imagine I have room for one of those Dennis but thanks for the advice. And Havaianas for showers that aren't too clean and midnight loo visits! Sarong! Of course! Thanks Lisa. Probably covered but id add sets of earplugs, a spare visor and visor insert if not already sorted? Have you put tyre sealant in your inner tubes...? I use the Halfords bicycle sealant... Costs virtually nothing and if it saves you one puncture repair... Incidentally.. Your puncture repair kit looks like a tubeless repair kit? Safe ride. From one CRF250L to another. The difference is that yours is going RTW, mine just traverse up and down Borneo. Have you been in touch with any of the over landers or Nick Sanders. I would have thought they are the ones who could give you the most advice. I would have thought you do not have to worry. I have seen and read stories of people on c90 travelling the world. Ride with as much that you are comftable with. I would say anything that you have to leave or can sell along the way. the handling of the bike has to come first. as you say you can buy or borrow along the way. if ever you need a hand you can post on a forum for advice. have you communications sorted out? that might be easier to organise so you are in touch and able to ask over the net. you will not be alone. or you can try to find a web cafe to log on. Yes I am in touch with a few overlanders. I used to work with Nick and everyone is being very helpful. Thanks. It is very true that the net will be a great source of information and comfort on my journey. It was good to see you at the bike show, being about 5'6" myself, I want to know how you settled on the CRF 250, as it is quite high. Did you manage to get the seat lowered and if so how did you do it. 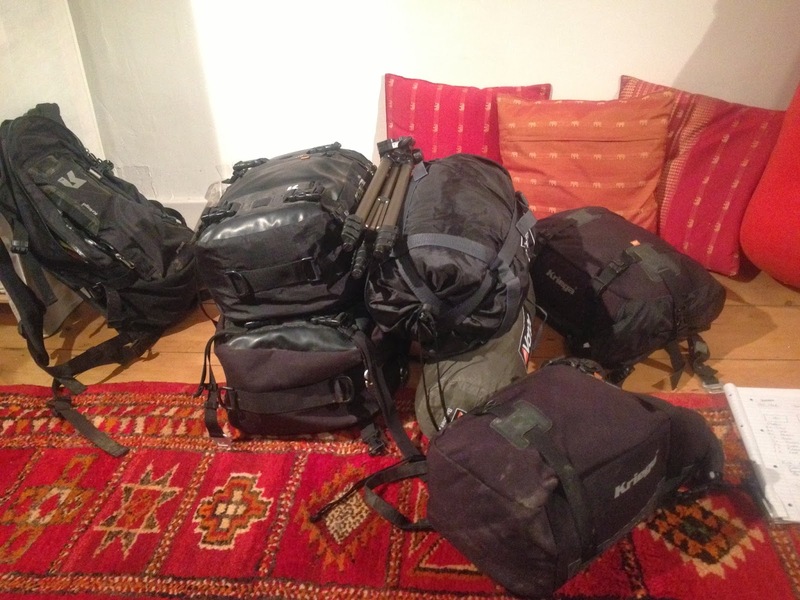 It seems such a lot of kit, how much does it all weigh? How much water and petrol are you planning on carrying? I am planning a similar trip for next year, not sure whether to take a small road or trail bike, or even a 125cc microcar of my own construction, either aPeel P50 or Mopetta replica. very tidy .. love it. Aquarium canister filters go along with their own sets of benefits and drawbacks. remember of each the professionals and cons to grasp if you'll be able to stomach the trade-off. Since canister filters area unit situated outside of the marine museum, its outside location provides you lots of benefits, for more information visit here Andrew's site.